Presentation by Cary Loren on Jim “Flash” Miteff, a kinsman of Karlheinz Weinberger. 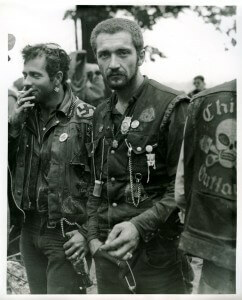 In the 1960’s Jim “Flash” Miteff (1933-1999) spent six years documenting and riding as a member with the notorious Detroit chapter of the Outlaws Motorcycle Club. The photographs are steeped in the subculture of the 60’s, and they are hauntingly similar to those taken by Karlheinz Weinberger. Cary Loren is one of the founding members (with Mike Kelley, Jim Shaw and Niagara) of the renowned Detroit-based band Destroy All Monsters. He is a critic, musician, photographer and independent film maker.